Smurf avoids the hydraulic with the log stuck in it. Our 10-week spring kayaking class at the local YMCA is almost over. We've spent time teaching rolling and basic strokes in a small pool augmented only by slalom gates and our own imaginations. Some of our activities are of our own creation, but one we owe entirely to Tom Lindblade, president of the Illinois Paddling Council, instructor trainer for countless canoe instructors, instructor to countless canoe students, advocate for local waterways and paddlers...in short, a mentor to us all. It's the "river in a box." Simply put, it's a long piece of denim on a gradient with some pieces of yarn and a bunch of rocks, sticks and other river accessories. Ours also features pillow stuffing to simulate whitewater, and a Smurf paddler with an awesome helmet you can't buy in any larger size. After showing a short film clip about river reading and talking about river features, how they're created and how they affect paddlers, we had our students create the river banks and eddy lines with the yarn and place the rocks, twigs and stuffing on the river. Then we looked at what our Smurf would experience as he headed down the river, choosing safe routes and play spots. Coaches: Course reporting just got easy. Really! 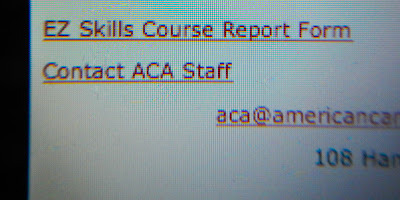 Every four years, ACA-certified instructors need to provide evidence that we've taught at least two courses (including one at our level of certification) and participated in one instructor update. Doing those things has never been an issue, but reporting them has felt like a hassle. ... and the form pops up! Yes, we still have to remember our nine-digit ACA numbers (how we miss the five-digit ones! 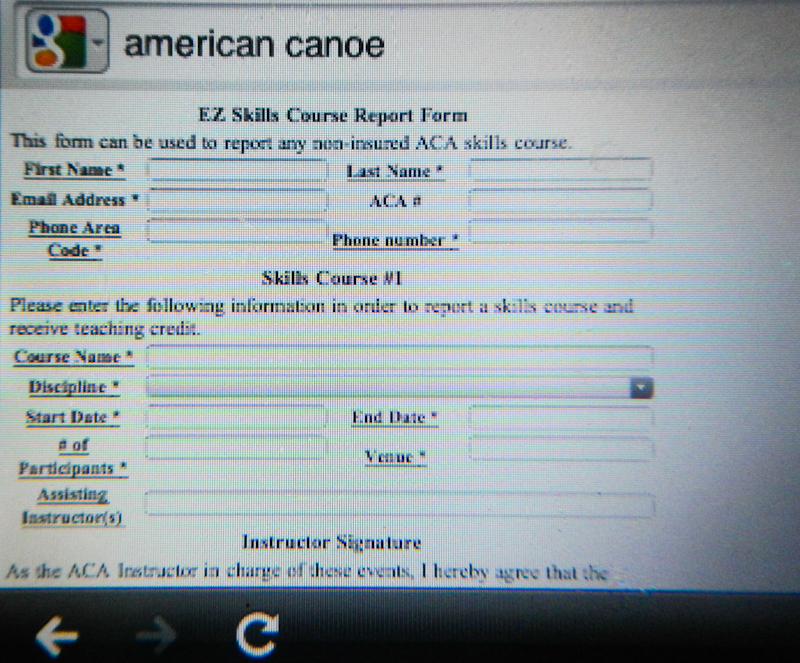 ), but other than that, it could not be easier to register courses and keep our certifications. There are other reasons to register courses, too. Like any advocacy organization, the ACA derives strength from numbers. It keeps track of how many students undergo training and therefore become safer paddlers; this information is useful when it seeks funding for everything from education to stewardship. So no more excuses. And no more cringing when you get the email warning that your certification is in jeopardy. It just doesn't get EZier than this. CASKA night at the UIC pool. Earlier this week, we organized an evening of instruction for CASKA, the Chicago Area Sea Kayakers Association. We are board members of this club, which has a mission that includes promoting safe paddling. An excellent recent article by Howard Meyerson in the Grand Rapids Press demonstrated the need for more general awareness of the connection between instruction and paddling safety. Meyerson reported about a novice paddler who purchased a 12-foot boat and set out from Glen Haven to South Manitou Island, unprepared in every way for the challenge of an open crossing in cold weather. His adventure ended in a Coast Guard helicopter rescue. Stories like this vex sea kayak coaches because they are so familiar. We've all met plenty of people who don't see the need for instruction--people who have too much confidence in themselves and too little respect for the value of training. They get themselves in trouble and also endanger the people who have to rescue them. And they give paddlers a bad reputation. By contrast, the 14 people who came to the pool for instruction earlier this week demonstrated a respect for the sport, an awareness of the risks, and a willingness to pay money to improve their skill and knowledge. 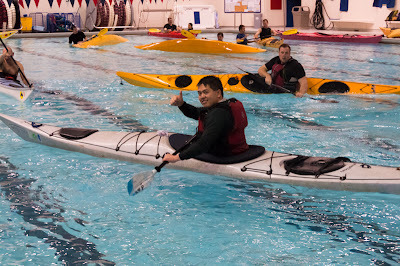 It was a great fundraiser for the club, but also a morale booster for all of us who have spent time and money to become skilled paddlers and coaches, and who are committed to helping others paddle safely. 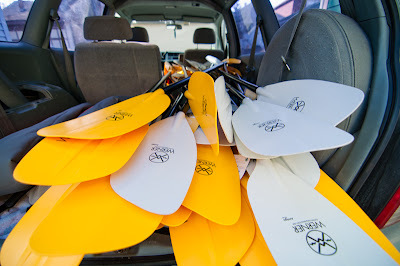 We just picked up 26 new Werner paddles from Geneva Kayak Center for the Chicago Whitewater Association's pool classes. We can't wait to get them in our students' hands! An SKUK Expedition Center in Illinois? When we think about Sea Kayaking UK Expedition Centers, we think about Wales, Scotland and Cornwall -- places situated in the UK and on the sea. Turns out there are 16 Expedition Centers in North America, too, but they're primarily situated (not surprisingly) on the coasts: Maine, North Carolina, San Francisco, Washington. 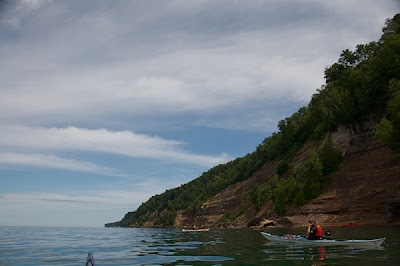 Except for two: Living Adventure on Lake Superior in Wisconsin, and Geneva Kayak Center* in Yorkville, IL. Yorkville? We had to ask co-owner Ryan Rushton how this came about. Ryan Ruchton at Geneva Kayak Center. Q: How did you earn this designation? 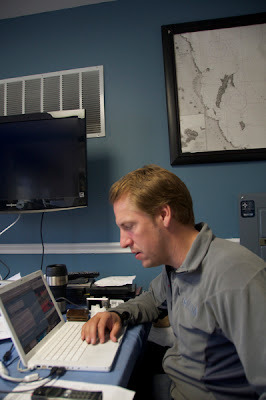 A: Each Expedition Center has to be staffed by at least one BCU 5-star Sea Leader award holder. We actually have two on staff; Scott Fairty and I are the only 5-star paddlers in the region to the best of my knowledge. Being assessed as a BCU 5-star paddler requires years of sea kayaking in different environments, ability to handle your boat unconsciously in advanced conditions and possessing high levels of leadership and seamanship. beautiful, amazing place to paddle. Nigel [Dennis] wanted to give paddlers from around the world the option to use his boats and Lendal paddles in places like Alaska, Greece, Newfoundland, Maine, Iceland, Norway, Georgia and Baja. Beyond using his boats, he wanted to make sure they would have the top leadership for courses and expeditions when paddlers traveled to these locations. Chicago is a great place to paddle and an excellent training ground for sea kayaking. Q: You aren't exactly on the coast. So how does that work? A: While Chicago is a great place to paddle, we do not have the venue that other SKUK Expedition Centers have. The major hurdle was simply putting an expedition center in Chicago. Our top level programs on the local and regional level, combined with our regional, national and international adventure paddling programs put us over the top. 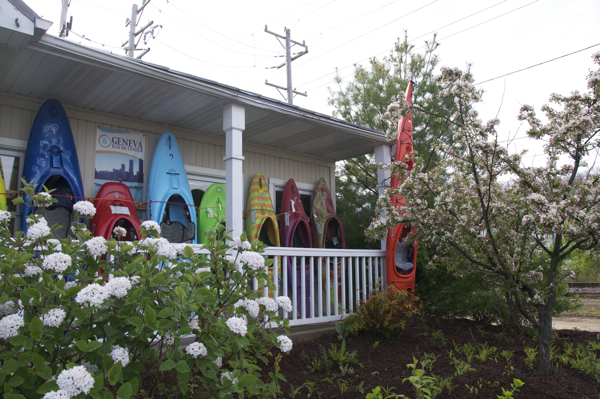 Geneva Kayak Center offers paddling trips far beyond Chicago. Q: What will this mean for Chicago area paddlers? 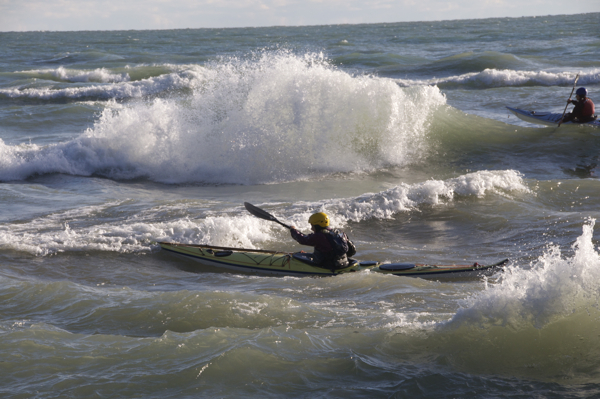 I hope that this will be an additional factor in bringing more national and international exposure to paddling in the Chicago area as well as the Great Lakes. Chicago's Lakefront is a seriously good sea kayak training ground. The variety of landforms and fetch in multiple directions gives paddlers the conditions needed to improve as sea kayakers. Combined with focused training on high volume whitewater rivers, Midwest paddlers can come to GKC for training that will prepare them to paddle anywhere in the world. Q: What will it mean for Geneva Kayak? A: Designation as an Expedition Center is a big step for Geneva Kayak. 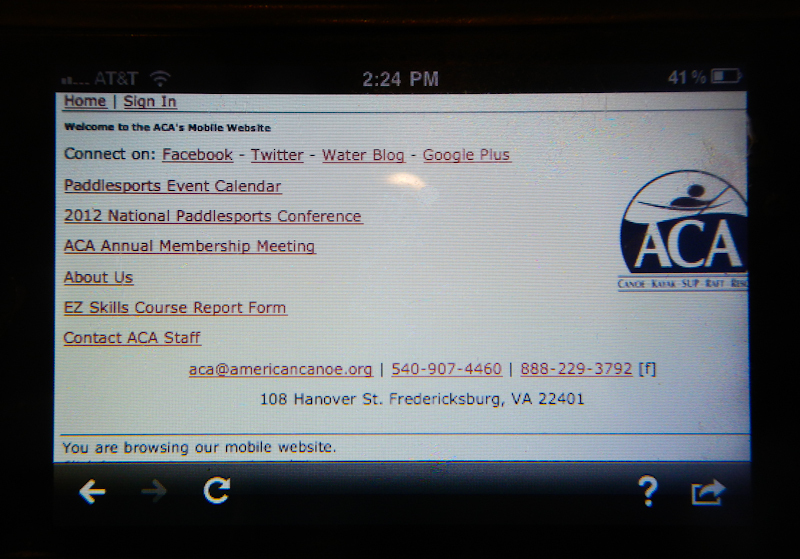 In 2011 we were designated as an ACA [American Canoe Association] Pro School, which gave GKC national recognition for our kayak school. International recognition of our excellence in sea kayaking programs is a big step for us. A: We will continue to build both our school and travel offerings. We hope to be training paddlers and taking them to amazing destinations for a long time! *Full disclosure: We teach for Geneva Kayak Center.